The neat way they mount. The Chase after the handkerchief. THE COSSACKS AT THE WILD WEST SHOW. By their importation into the midst of the Wild West, at Earl's Court, Colonel Cody's Cossacks afford a ready proof of the assertion that "extremes meet." The Cossacks are sandwiched between an exhibition of Cowboy fun and of racing between American backwoods women; but the entertainment hardly sustains a break in consequence, for the Cossacks are funnier than the Cowboys, and ride better, if possible, than the ladies. The troupe make their first appearance in the processional review, and the orator of the show begs to introduce them along with the other brave and fair, who welcome them with that peculiar crow by which the wild children of the prairies indicate a thirst for blood, or, it may be, a desire to be friendly. Their performance, however, does not take place until the Red Indians have shown how they can attack an emigrant train without loss of life or injury to property, and until Johnny Baker has let people see what he can do when he has not come out without his gun. Then the Cossacks, in grey caftans and terra-cotta skirts, ride solemnly into the arena, the orator remarking that they will now exhibit their national characteristics. As they ride they sing, and on the bleak and distant steppes the performance is no doubt regarded as a first class entertainment. 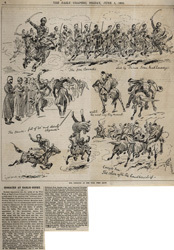 By West Brompton, however, this "musical ride" will, perhaps, be regarded as inferior in several particulars to that of the 17th Lancers at the Military Tournament; and if ever Lord Salisbury does impose a tax upon imported luxuries this will very likely be one of the first to feel the burden. They stop rather suddenly, as if realising all at once that they are making themselves unpopular, and dismount. Then they range themselves in a row, clap their hands to keep time, and alter the tune. Meanwhile a couple of Cowboy admirers have dragged up a wooden platform; and the Cossacks enter upon the second of their national characteristics—which is their dancing. One of the terra-cotta row falls out of the ranks, waves his arms encouragingly to his friends, and whirls himself into the Cossack "Ta-ra-ra-boom-de-ay." His whirling skirts lend the dance more than a distant resemblance to the English version, and as an artistic combination of abandon and restraint, even Miss Collins might borrow a hint from it. Fired by the example of the first performer, first one and then another of the band come and join the dance; but there is always some one left to clap, and it is long before they stop singing. The entertainment concludes with some splendid riding, picking up stones at a speed for which a Cowboy would not grudge admiration, standing with head upon saddle, riding backwards, and playing the Cossack game of "Hold the Handkerchief."